NASA's Aqua satellite captured in infrared-light image of Hurricane Max that showed the storm weakened quickly as it made landfall in southwestern Mexico. Max quickly degenerated into a large area of low pressure. 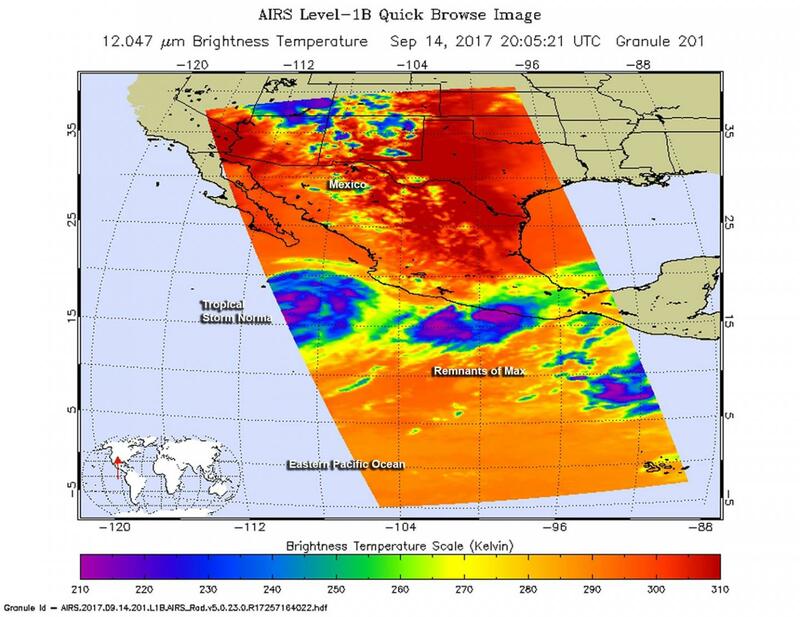 The Atmospheric Infrared or AIRS instrument aboard NASA's Aqua satellite captured infrared data on Max on Sept. 14 at 4:05 p.m. EDT (2005 UTC). At the time of the image Max's center appeared to be moving onshore to the east of Acapulco, and the eye that was observed in satellite imagery had disappeared. The AIRS data showed that the coldest cloud tops were colder than minus 63 degrees Fahrenheit (minus 53 degrees Celsius). Those storms were found around the center of circulation and over the coast of Mexico's Guerrero state. Infrared data provides temperature information to scientists. Cloud top temperatures are an important factor when it comes to determining the strength of storms. The higher the cloud tops, the colder and the stronger the storms. NASA research has shown that storms with cloud tops that cold, reached high into the troposphere and had the ability to generate heavy rain. On Sept. 15, the National Hurricane Center said that "The remnants of Max are still capable of producing total rainfall accumulations of 5 to 10 inches in the Mexican state of Guerrero and western portions of the state of Oaxaca. Maximum amounts locally in excess of 20 inches are possible over coastal areas of Guerrero. These torrential rains may produce life-threatening flash floods and mudslides." The National Hurricane Center issued the final advisory on Max at 5 a.m. EDT on Sept. 15. At that time the remnants of Max were located near 17.0 degrees north latitude and 98.0 degrees west longitude. That's about 125 miles (200 km) east of Acapulco, Mexico. The remnants are moving toward the east-northeast near 5 mph (7 kph), and this motion is expected to continue until dissipation later today. Maximum sustained winds are near 30 mph (45 km/h) with higher gusts. The remnants of Max are forecast to dissipate later today, Sept. 15.